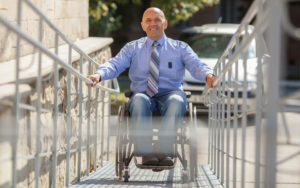 Which Wheelchair Ramps Will Work for My Needs? 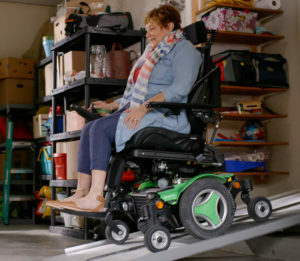 Wheelchair ramps for the home are generally among the first purchases for families or individuals who have recently moved to a wheelchair or scooter for mobility. Without the ability to exit a home, a homeowner or renter is segregated from and can't remain an active participant in his or her community. There are many styles of ADA wheelchair ramps available for home exteriors.Take a look at the list below and follow the links for information on purchasing a ramp. BraunAbility is not affiliated with any handicap ramp manufacturer or seller and does not personally endorse any of the following companies. These resources are listed as an aid to those needing more information on wheelchair ramps for the home and like every mobility purchase, additional reviews and research should be conducted prior to product purchase. Wood ADA ramps are the most common ramp type for personal use because they can be built or replaced using common tools found at your local home improvement store. Each year, BraunAbility partners with Servants at Work, Inc. (SAWs), an Indiana nonprofit that builds wheelchair ramps for people with physical disabilities allowing residents to reconnect with their communities and providing a safer option for entering and exiting their home. Ramps are designed by a team leader and constructed over the course of a few hours. For more on SAWs or to apply for a ramp, click here. Concrete wheelchair ramps resemble a poured concrete ramp but are much lighter and less expensive to install. Click here for more information and to purchase. Aluminum wheelchair ramps are a popular solution because their manufacturing process makes each module fit together easily and can be configured to fit most standard homes. Click here for more information and to purchase. Portable handicap ramps are very popular among short-term users or long-term users on a budget. Portable ramps are generally fairly inexpensive and are normally made out of aluminum. These ramps can be found in a variety of lengths, widths, and stowing configurations and can be ordered online. For these reasons, it's simple to find a ramp that will fit your home and weight capacity needs. Click here for more information and to purchase. Galvanized steel wheelchair ramps are more industrial-looking than a wood ramp and have the added bonus of not allowing for elemental buildup. However, ambulatory guests or homeowners will find this material challenging when barefoot or wearing unstable footwear, such as heels. Click here for more information and to purchase. Knowing what kind of ramp will work best for you starts with learning the proper terminology. Wheelchair Ramp Rise - Rise is the verticle height of the ramp. You will know what rise you will need by measuring the height of your stairway. Wheelchair Ramp Slope - Slope is the steepness of the ramp. Usually, you'll see this written as a ratio of rise to length. For example, a slope of 1:15 means for every inch of rise, there are 15 inches of ramp length. A steeper ramp means less material and a cheaper installation. However, a wheelchair user will likely need an attendant on a steeper ramp. The Americans with Disabilities Act requires a slope of 1:12 and ramp width of 36 inches. Click here to learn more about handicap ramp requirements from the United States Access Board. Click here to calculate your needed slope. Do you need a permanent solution or a temporary one? For some, a portable handicap ramp is ideal for its low rise and ability to be used in multiple locations. If your physical disability isn't permanent or if you need access to a relative's home or public space, a portable ramp is a great solution. For others, a permanent or semi-permanent handicap ramp will be ideal due to the need for a long slope or if an entryway requires multiple landings and turns. Ready to compare costs of ADA ramps? Check out this Home Advisor link for a cost breakdown.